Recently, I surpassed the age of sixteen, turning seventeen years old. Although seventeen means becoming one year closer to finishing high school and becoming a full-fledged, omniscient and legal adult, there is rarely much commotion associated with the age. When someone turns sixteen, he or she only is beginning to taste the freedoms of adulthood. A sixteen-year-old can drive a car, earn minimum wage, and traipse around malls unsupervised (this may only be applicable to my local malls, but it’s still considered a milestone). Seventeen, however, is commonly associated with more menial privileges: being able to purchase tickets to an R-rated movie autonomously and donate blood without a parent’s consent. But nobody ever talks about a sweet seventeen. Why not? Even though sixteen is seen as the prominent milestone in a teenager’s life, the age of seventeen is still frequently used in songs and movies. Zac Efron portrayed someone who so desperately wanted to relive his youth that he was given the chance to live as seventeen again. Songs like “Dancing Queen” focus on a woman having the time of her life being “young and sweet, only seventeen.” Other songs such as The Beatles’ “I Saw Her Standing There” sang about how “she was just seventeen,” implying the purity of a such a young age. Seventeen is the last year before reaching adulthood, and all of these forms of media encourage young adults to maximize their youth. The song that perhaps stuck out to me most is a classic tune from The Sound of Music. The ballad that the majority of my birthday greeters referenced, saying, “Oh, you’re sixteen going on seventeen! Just like the song.” I appreciated these comments at first—until I sat down and listened to the song in its entirety, lyrics and all. The song “Sixteen Going on Seventeen” portrays the relationship between Liesel, a young woman turning seventeen, and her platonic friend, Rolf, who is one year older and pledges to take care of her. With an initial listen, this song seems like a kind-hearted tale of Rolf promising to look out for his friend. On closer examination, however, one discovers that Rolf is in fact patronizing Liesel in a way, as if she is not mentally or physically capable of taking care of herself. To many, a mention of “sixteen going on seventeen” elicits a sentimental tribute to the era of The Sound of Music when women were believed to be weak, fragile creatures, however, it has lost its place in the modern world where women are continuing to advocate for self-sufficiency and are working to prove that we are every bit as capable as men. Sure, we are young women who are not quite adults, but that does not transcribe into needing to be cared for by a male who is barely, if even at all, more experienced with the world. We cannot be perceived as property or an object to be taken care of. We are older, wiser, and stronger than the song implies, and must continue to break the barriers and beliefs that we should be confined to a certain societal expectation. It is 2016, and women are still far from being equal. Even on the emoji keyboard for Apple, there are men as doctors, police officers, and detectives . . . but women are confined to being brides and getting a haircut. That should not be a life ambition. Even though I may only be seventeen, and distant from becoming self-sufficient, it is critical that young women do not feel demoralized or less than a male who is equal their counterpart. Unlike how Liesel is portrayed in The Sound of Music, we are not in need of an eighteen-year-old boy to take care of us and show us the world, as we are powerful and mature enough to explore it and conquer it on our own. Elysia is a senior in high school and an alumna of the 2015 Iowa Young Writers' Studio. She currently serves as the Poetry Editor for Glass Kite Anthology and her (current) favorite author is Cheryl Strayed. 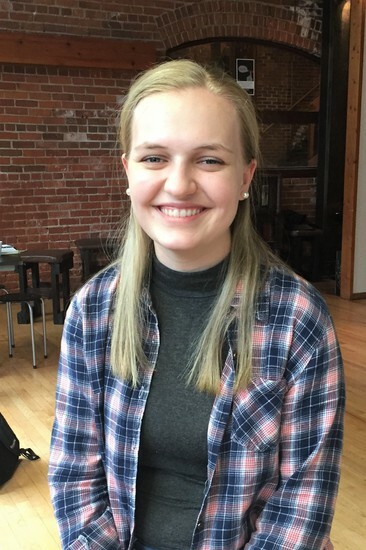 Elysia's work has received multiple honors, including the Scholastic Art and Writing Awards, and most recently, the White Bear Center for the Arts WriteNow! contest.